Slots fans with a passion for pirates will like Gold Ahoy. 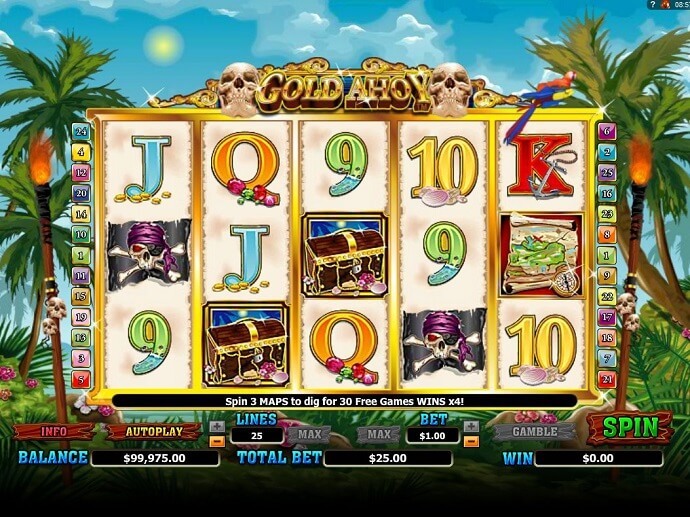 Gold Ahoy is a slot game from Amaya/Chartwell that should appeal to those who like pirate tales and men who say Yarr! a lot. It is beautifully illustrated. Topped by a cheeky parrot and two grinning skulls, the solid gold reel frames are suspended in front of a tropical island paradise, all palm-fringed beach and cerulean skies. Skull-bedecked torches flank the reels. A jaunty pirate shanty accompanies the action throughout. Gold Ahoy has five reels displaying three symbols each, with 25 adjustable pay lines. The reels are designed as tattered strips of parchment, and the symbols also conform to the pirate theme. Players can bet from 2 to 500 coins per line on each spin. Although Gold Ahoy uses the standard slots poker symbols, in this case 9, 10, J, Q, K and A, as its low-value icon, it brightens them up with different colours and the addition of a little adornments related to pirates and the sea. The 9 is encrusted with barnacles, for example, while the Q is accompanied by jewels and the K by an anchor. The parrot-perch A, which wins the same prizes as the K, wins 200 coins for five matches on a pay line. Two medium-value symbols also win equal-value prizes; the cutlass and the bottle of flotsam rum buried in the sand. These each win 25, 100 or 500 coins for three, four or five of a kind. A piratically attired skull and crossbones begins paying prizes with 5 coins for two of a kind, then pays 50, 300 or 1,000 coins for three, four or five matches, respectively. The sailing pirate ship also pays 5 coins for two matches, then 100, 750 or 10,000 coins for three, four or five of a kind. A fearsome-looking bearded pirate, complete with plaits in his hair and a jewelled eye-patch, is the Gold Ahoy Wild icon. It has the usual substitution power for all the ordinary symbols, able to stand in for them to complete winning pay lines. Whenever he is involved in a win, the pirate leans out of the frame and booms a hearty Yarr! The Wild also wins prizes for successive matches of two or more with itself, starting on Reel 1. The prizes for two, three, four or five Wilds are 10, 250, 5,000 or 25,000 coins. Gold Ahoy boasts two bonus icons, both of them Scatters, so they do not have to combine on one pay line to trigger the bonuses. The Chest Bonus is triggered by three or more Treasure Chest Scatters. If these occur anywhere on the reels, the other symbols fade to monochrome and the chests are highlighted. The player must open one chest with a cutlass to reveal the hidden coin prize. The Treasure Map Scatter triggers the Free Games Bonus when three or more appear, which plays on the same reels but with the backdrop transformed into a golden sunset. First, the player of casino games Canada must pick a series of Xs on the treasure map. Each one reveals an extra number of free games, or an extra multiplier for the round. When the player picks an X that hides Ol’ Davey, the pirate skull and crossbones, the free spins commence at the total number of spins and multipliers the player has gathered. The multiplier is also applied to any Chest Bonuses that occur during free spins.